Frances Wilson is a London-based pianist, piano teacher and writer on classical music and pianism. 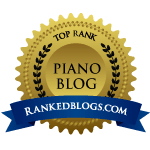 This is the blog of Frances Wilson’s Piano Studio, and is intended as an exchange of information specifically for piano teachers, piano students and parents of piano students. Many of the posts are written specifically with my students in mind and cover aspects such as productive practising, resources for pianists and piano students, repertoire and reviews of teaching materials, including apps and tutor books. A classically-trained pianist, Frances Wilson holds Licentiate and Associate Diplomas in Piano Performance (both with Distinction), and since 2006 has run a popular private piano teaching studio from her home in SW London. For more information, including current lesson fees and full terms and conditions, please visit the studio website www.franceswilson.co.uk. Frances blogs on music, pianism and culture as The Cross-Eyed Pianist, writes a regular column on aspects of piano playing for ‘Pianist’ magazine’s online content, and is a guest writer for Hong Kong-based classical music website Interlude HK. Comments, suggestions and guest posts are very welcome: please use the Contact page to get in touch with me.